Louis Durey was born in Place Saint-Germain-des-Prés, Paris, on May 27th, 1888, to a French bourgeois family in the printing industry. It was only in around his twentieth year, after discovering Pelléas et Mélisande, that his taste for music lead him to study harmony, counterpoint, fugue and composition, as a private pupil, outside any school, under the guidance of Léon Saint-Réquier who was at that time a teacher at the Schola Cantorum and Choirmaster of Saint-Gervais. His first compositions date from 1914. They bear witness to his deep affinity for the music of Claude Debussy. That same year, chance led to his discovery of a melody by Arnold Schoenberg, part of Das Buch des hangenden Garten. This beam of light showed the way to all his subsequent researches and it was with the Offrande lyrique (Op. 4) that his own personality began to emerge, drawing on all the resources of his imagination - without a doubt the first in France to use so thoroughly liberated a musical language. In 1917, he composed Eloges (Op. 8), on three poems by Saint-Léger Léger, which he himself, in 1977, considered one of the most representative pieces both of his musical career and of his own personality. 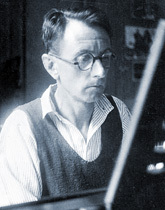 Still in 1917, along with Erik Satie, Georges Auric and Arthur Honegger, he formed the small group of «Nouveaux Jeunes», which in 1919 became the «Groupe des Six». Louis Durey withdrew from the «Groupe des Six» in 1921, without, however, breaking the close ties of friendship which had always kept them together. In 1920, he wrote Trois préludes for piano (Op. 26), dedicated to the memory of Juliette Meerowitch, who was the first to perform his music, at Salle Huyghens on June 6th, 1917. His helders encouraged him : Albert Roussel, Florent Schmitt, Charles Kœchlin and above all Maurice Ravel, who moreover sponsored his entry to the S.A.C.E.M.. In 1921, there followed Deux études for piano (Op. 29) : Eaux courantes, Eaux dormantes, inspired by the great pianistic tradition pioneered by Liszt, Debussy and Ravel. In Saint-Tropez, in 1923, he composed L’occasion (Op. 34), a one act lyric comedy based on Prosper Mérimée. This work developed his taste for choral writing. He wrote also numerous harmonisations of French folk songs. These two poles of attraction became a kind of way of life for him from 1944 onwards. With Six pièces de l’automne 53 (Op.75), Louis Durey returned to «pure» music, leaving aside for a while the expression of ideas via the intermediary of the singing voice. He was 80 when he composed Nicolios et la flûte (Op. 111), from an episode in Nikos Kasantzaki’s novel, Christ recrucified. Here he found exceptional freshness and felicity of expression. Between 1967 and 1974, he wrote, periodically, Autoportraits, 16 pieces for piano (Op. 108), Trois pièces pour le piano (Op. 109) as a complement to Autoportraits, and Poème for piano, 116th and last opus, which was the 20th and last part of the Autoportraits series, in which he sought purely subjective expression, a true self-portrait, such as Rembrandt created in his own way. The works of Louis Durey, totalling 116 catalogued pieces, cover all fields - except the ballet. He had little to do with the stage or with the symphony orchestra, but composed the music for several documentary films. He was also involved in various musical collaborations. He refused to be classified, too protective of his right to complete freedom of expression. Always seeking renewal, he defined himself as a continuity of varied aspects. Through the various aesthetic digressions and influences, his music always expresses his sentivity and humanism.